Hands down one of the best dental visits I’ve ever had. The whole process from start to finish was such abreeze! The staff called me ahead of time to verify my dental insurance information & let me know about my possible copay with my insurance, which I really appreciated! The front desk team was very personable and helped me to get all of the appropriate paperwork filled out. Dr. J was definitely the highlight of my visit! She introduced herself to me before moving forward with anything and asked me what my concerns were. I really appreciated this as it felt more personal and I was able to explain my previous dental fears. Her & her team helped me to feel so much more comfortable. The whole appointment was painless and so easy. She showed me my x-rays and pointed out a few areas of concern (understandable as it’s been a minute). She never once made me feel bad about the fillings I need, and in fact recommended a great toothpaste to try. I even received a few samples to try out! She was also able to recommend her in house orthodontist to me to fix some overcrowding I have (my main concern!). I loved that I can take care of all of my dental concerns in one area, without having to bounce from office to office. All around, I could not recommend Dr. J and the team here more!! Hands down one of the best dental visits I’ve ever had. The whole process from start to finish was such a breeze! The staff called me ahead of time to verifymy dental insurance information & let me know about my possible copay with my insurance, which I really appreciated! The front desk team was very personable and helped me to get all of the appropriate paperwork filled out. Dr. J was definitely the highlight of my visit! She introduced herself to me before moving forward with anything and asked me what my concerns were. I really appreciated this as it felt more personal and I was able to explain my previous dental fears. Her & her team helped me to feel so much more comfortable. The whole appointment was painless and so easy. She showed me my x-rays and pointed out a few areas of concern (understandable as it’s been a minute). She never once made me feel bad about the fillings I need, and in fact recommended a great toothpaste to try. I even received a few samples to try out! She was also able to recommend her in house orthodontist to me to fix some overcrowding I have (my main concern!). I loved that I can take care of all of my dental concerns in one area, without having to bounce from office to office. All around, I could not recommend Dr. J and the team here more!! Dr. Anne Marie Jardeleza completed her undergraduate education at the University of Illinois with a degree in psychology, and a minor in biology. She then continued to earn her Doctor of Dental Surgery at the University of Illinois Chicago. Dr. Jardeleza believes that patient education is key to optimal oral health. She takes the time to teach each patient various methods to care for themselves in order to prevent disease and have the best health possible, thus minimizing the need for extensive dental treatment. Dr. Jardeleza has been honored with several awards, such as the Frances Best Watkinds Award for outstanding leadership skills, academic excellence, and dedication to dentistry. She is currently an active member of the American Association of Women Dentists, the American Dental Association, the Illinois Academy of General Dentistry, the Academy of General Dentistry, and the Chicago Dental Society. 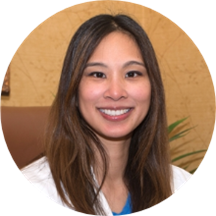 Outside of work, Dr. Jardeleza enjoys being active; trying new foods; and spending time with friends, family, and adorable dog. It was great! I appreciated her explanation of the procedures and how I could improve the health of my gums and teeth. Awesome visit! I just had a bad experience with this location. Nothing wrong with the dentist per se, but the dental hygienist was not at all empathetic about the severe pain I was experiencing, as she was taking x-rays. The dentist performed cleaningwithout informing me that there would be extra charge. Did I need cleaning? Probably. Would I have liked being able to make an informed decision? Absolutely. The administration was also problematic. I needed to call them back to follow up on couple of things, and they had no record of what they said was going to be taken care of. The issue still remains unsolved. Overall, I'm certain that I won't be recommending this place to my friends. Awesome! Seems like the office is organized and I really liked the staff. Everyone knew what they were doing, they made sure my insurance was all set ahead of time which isn't always standard, and I didn't feel rushed. Pretty disappointing. Only words said were "open, close" and then went on to try to upsell. Will not be returning. Very satisfied with the services provided. The entire the staff was friendly and highly accommodating. Excellent! Very kind and took good care of my teeth and it was a nice quick appointment. The office was nice and clean. The staff was excellent and the Dr. had a great bed-side manner. I just went in as a first time patient for a cleaning and an exam. I found them on Zodoc and made a next day appointment for a Saturday. Parking was easy. The front desk admin, Kateryna, was as helpful asshe was kind. After I filled out some forms, I waited no more than 10 minutes to go into the chair for my exam and cleaning. The dentist made the experience great and he was thorough in my evaluation. It was quick and easy and I wasn’t pressured to have any services added on the spot as some places do. My Delta Dentla covered the X-rays, exams, and cleaning. Couldn’t be happier with my service. Thank you! My visit was not with Dr. Anne Jardeleza, but the doctor I did see was wonderful! She was fantastic. I had two fillings done in 30 minutes and it was completely painless. All the costs were explained to me beforehand and I felt very comfortable being there. I will definitely be coming back to this location for all my dental needs. So glad I discovered this location. I have been in the area lots and had no clue it was there. The front desk staff were very friendly before and after my appointment. The lobby and entire office are large and theservice was great. It seems they have everything you could need in this location which is so convenient. I got a number of x-rays done including a full panoramic to see the wisdom tooth pain I have been dealing with. It was a busy afternoon so I did have periods of waiting but nothing outrageous. Dr. J as someone called her was awesome. Very kind and thorough. She explained everything as we went and gave me options. She also pulled in an oral surgeon Dr. Abu who did a consultation for me even though I didn't have an appointment to meet him. He was nice but talks waaaaaaay too fast. He shares really important info and I had a tough time keeping up because he shared so much, so quickly that there was little time to process. Overall They were very accomodating and walked me through treatment plans. I also appreciate that they didn't make me feel ashamed (even though I felt that way for taking so long) for taking so long to return to a dentist after my last check-up with a boutique dental office where I didn't have the best experience.